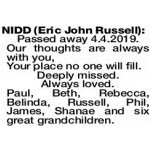 Eric passed away on 4.4.2019. A great life, well lived on his terms, he will be sadly missed and was very loved. 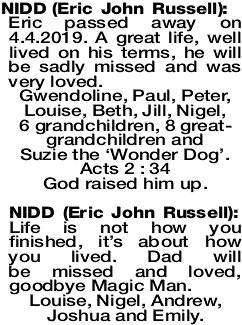 Gwendoline, Paul, Peter, Louise, Beth, Jill, Nigel, 6 grandchildren, 8 great- grandchildren and Suzie the ‘Wonder Dog'. Acts 2 : 34 God raised him up. Life is not how you finished, it's about how you lived. Dad will be missed and loved, goodbye Magic Man. Louise, Nigel, Andrew, Joshua and Emily. The Funeral Service to celebrate the life of the Late Mr Eric Nidd of Donnybrook, formerly of Northcliffe will be held in the All Saints Anglican Church, 126 South Western Highway, Donnybrook at 12pm on FRIDAY (12.4.2019). No flowers or cards by request. Please make a donation to support hbfrun2019everydayhero. Your place no one will fill. Deeply missed. Always loved. 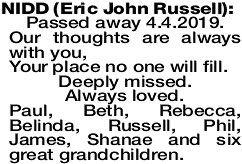 Paul, Beth, Rebecca, Belinda, Russell, Phil, James, Shanae and six great grandchildren. 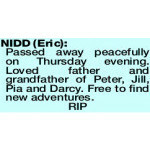 NIDD ERIC Passed away peacefully on Thursday evening. Loved father and grandfather of Peter, Jill, Pia and Darcy. Free to find new adventures.